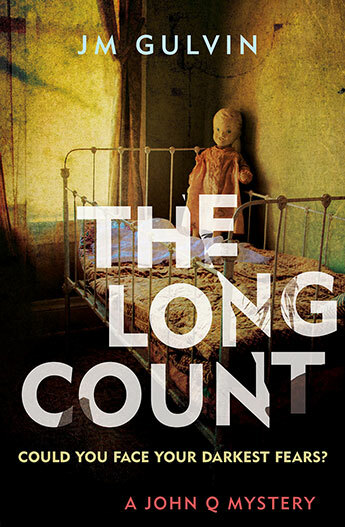 JM Gulvin is initially a little coy about the timeframe of The Long Count, the first in a new series centered around Texas Ranger John Quarrie, or John Q to his friends. Hints are dropped through the early text – Vietnam gets a mention and it appears that student rioters are taking up the time of the police – slowly building a picture of the late 1960s. The secrets that drive this book are also closely held and sparingly doled out, through to the startling revelations left to the very end of the book. When the book opens, John Q, his young son James and his friend Pious are grabbling – freediving for catfish in the submerged wreck of a train. The long count of the title refers to the length of time an experienced grabbler can stay submerged. But their idyll is disturbed by the discovery of bones in the wreckage. This is closely followed by John Q being called out to investigate the killing of a policeman. That killing, followed a separate murder, and spirals out into a wave of other crimes and John Q starts to track the killer across Texas. Soon the trail points to Ishmael, an asylum escapee whose father has also been killed and John Q connects with Isaac, Ishmael’s Vietnam vet brother, as he tries to solve the case. John Q is a traditionalist but is also a determined, lateral and sympathetic investigator. He carries two pistols on his belt and, in a bit of a homage to the old West, is established early on as the quickest draw in Texas. The 1960s Texas setting is well handled. And depriving characters of modern aids like mobile phones and sophisticated forensics adds to the Wild West feel of the book and allows for tension to build through the vagaries of communication. There is a lot going on in The Long Count and because of this it is easy to miss the clues that Gulvin litters through the narrative. But they are there. And the final revelations give the whole tale a new spin. However, while the resolution is clever and satisfying on one level, it feels a little too neat. Still, John Q is an intriguing new addition to the crime scene and is likely to return, six shooters and all.